The British Museum is usually on just about every list of must see things in London for good reason. I went on my first trip to London many years ago. After seeing some photographs of the British Museum’s new roof, I thought it might be worth a return visit. I wasn’t sure I wanted to spend a whole day at the British Museum because London just has so much to see. I wondered if I would be able to see the British Museum highlights in three hours. 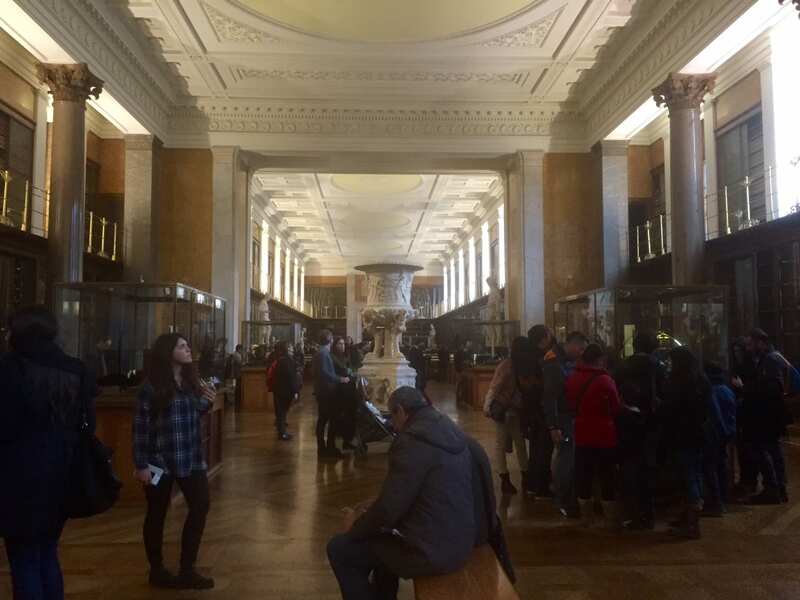 Let me tell you about our quick visit to the British Museum and give you some tips if you are short on time too. 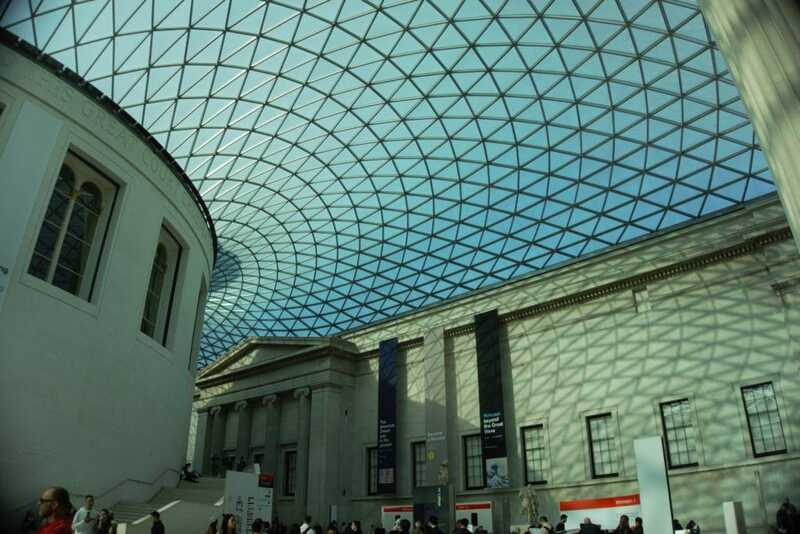 The new roof at the British Museum is spectacular! We checked out the website to see if we could come up for a plan to see the British Museum in 3 hours. After all, we had done it for the Louvre. Well, we were pleasantly surprised to find a page on the British Museum website with their recommendations on what to see if you only have 3 hours. We printed the itinerary and we were ready to go. Did We Do the British Museum in 3 Hours? One of the best things about London is that most museums are free, including the British Museum. When we arrived, we were surprised to find a line to get in. You don’t have to buy tickets or pay an admission fee (except for special exhibits) but you do have to go through security, and luckily the line moved quickly. Next, we picked up a map and checked our coats (another line). I was planning on getting a British Museum audio guide, but there were so many people in the museum that they were actually sold out. All this took about 20 minutes. Room 1 in the British Museum. Lots to see including amazing books along the walls. Then we were ready to actually start seeing the museum. We were able to quickly find the first item on the list, the Sloane astrolabe. Then we looked around the room a little more. The walls were covered with books, we saw all kinds of old books like Homer’s Odyssey. We probably could have spent more time looking through the books but we were on a mission. On to the next item…..
We struggled to find the Stone chopper from Tanzania, which was the next item on the list. After circling the room twice, we decided to ask the guard. He told us that it was no longer on display and it hadn’t been for a few years. The website had not been updated. I’m not sure when the list on the website was put together but I did also notice that the audio guide reference numbers were not up to date. The British Museum has such an impressive collection of Egyptian artifacts. For the most part, we were able to find most of the items on the list, but we couldn’t find all of them. We didn’t realize that there were also pictures of the items on the website because the downloaded pdf was just a list with room numbers, descriptions (vague at times), and outdated audio guide numbers. Some of the rooms had a lot of artifacts in them too, so at times we felt like we were on a scavenger hunt. We really struggled in the jade room. The Rosetta Stone, which provided the key to the modern understanding of Egyptian hieroglyphs, because it has the same script in Egyptian hieroglyphs, Demotic Script, and Ancient Greek. Parthenon sculptures are taken from the Parthenon in Athens. There has been a huge debate over whether the British Museum should keep them. Easter Island Statue Hoa Hakananai’a, which is actually from Easter Island but one of the smaller statues there. Seeing it in person reminded me of how I really want to go there! Automated Model of a Ship which is actually a clock. If I would have had more time I would have spent it in this room as there were all sorts of beautiful clocks. The Lewis Chessman which is a medieval chess set from the 12th century. I had no idea the game had been around so long! The Sutton Hoo Ship Burial – This ship containing some amazing treasures from the 6th-7th century which was found in southeast England in 1939. I really enjoyed the Greek art at the British Museum. The Horse from the Mausoleum of Halikarnassos is a very impressive sculpture from 350 BC. The Portland Vase is a beautiful Roman Cameo vase from 25 AD. The vase was broken in 1845 and they did an amazing job to restore it. I was also surprised that the British Museum’s Lindow Man was not on the list of the top things to see at the British Museum. It is a body of a man who died sometime between 2 BC and 119 AD. The peat moss surrounding the body naturally mummified it. The body was only discovered in 1984 in northwest England. We just happened to stumble upon it in Room 50. Also, we noticed a crowd around Cleopatra’s Mummy in Room 62, which we thought was very impressive until I later learned it was A Cleopatra and not THE Cleopatra. The Lindow Man – hard to believe this is the remains of a man from about 2000 years ago. We ended up spending about 4 hours at the British Museum, including taking a brief break to sit and have a drink. Can you see the British Museum in 3 hours? Yes, but you have to stay very focused and stick to the plan. Having a short list of items to see is really helpful especially given a number of pieces in the museum. It would be even better if the British Museum updated their website and added pictures to the pdf version of the list. You should also be prepared for the crowds. 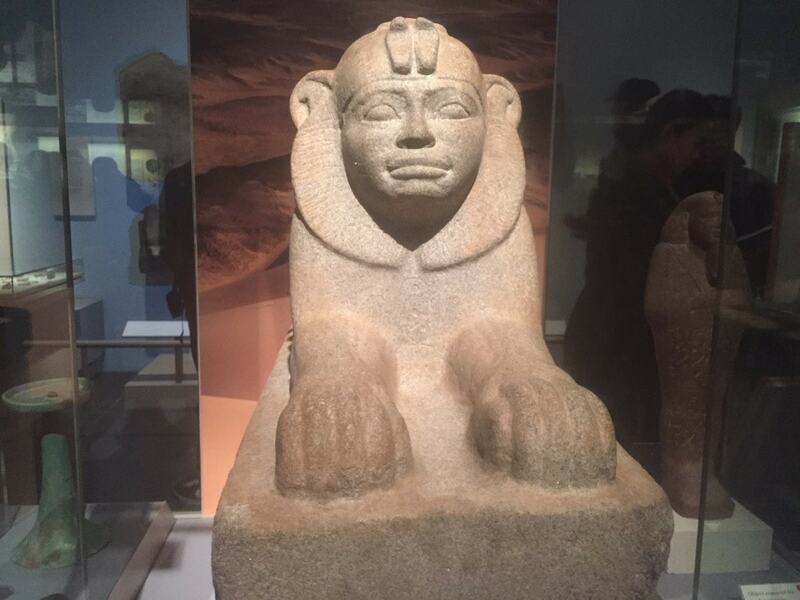 In spite of the challenges, I did really enjoy the British Museum and hope to go back and explore further. There are so many amazing artifacts! Thinking back, we may have been better off taking a guided tour of the British Museum. We wouldn’t have wasted time looking for specific pieces and our guide would have shown us the most important artifacts. You can choose from several different options on Get Your Guide. The tours last from 1.5 to 2.5 hours and are available in multiple languages. If you need to give your brain a bit of a rest, why not take a break for afternoon tea? The British Museum serves afternoon tea at the Great Court restaurant. It includes a selection of organic teas, finger sandwiches, pastries, and scones. Afternoon tea at the British Museum is surprisingly affordable, but you should book in advance. Click here to check price and availability. The British Museum is located on Great Russell Street in Central London, so it is easily accessible by public transportation. You can pick from four different underground stations which are all pretty close: Holborn (500m), Tottenham Court Road (500m), Russell Square (800m), or Goodge Street (800m). We were able to walk from our hotel. I would not recommend driving to as you will have to pay the congestion charge and parking is limited. If you do decide to drive, the closest British Museum parking is located at Bloomsbury Square. If you are looking for accommodation near the British Museum, you should consider the Hoxton. 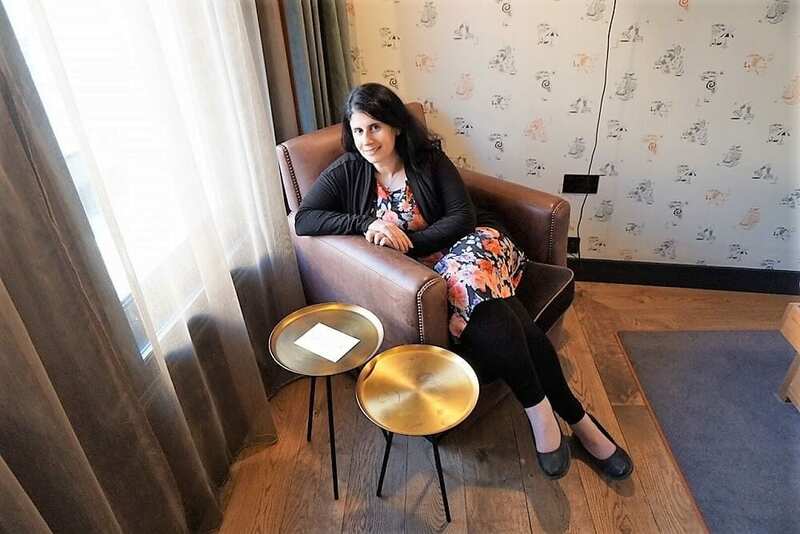 The Hoxton is a trendy hotel conveniently located close to the Holborn tube station and of course, the British Museum. The lobby bar is always a happening place but the rooms were very quiet. I loved the modern decor and the rooms are so comfortable. Every room comes with free WiFi, an hour of phone calls, fresh milk, tea and coffee, water and our daily breakfast bag drop. You choose the time of your breakfast and a bag filled with OJ, granola pot and banana gets delivered to your door. A great way to start a busy day exploring central London! If you are looking for more budget-friendly options, check out this list of hostels in Central London. If you are traveling with your dog, check out this list of dog-friendly hotels in London. Have you been to the British Museum? Do you have any British Museum tips? I would love to hear about your experience. 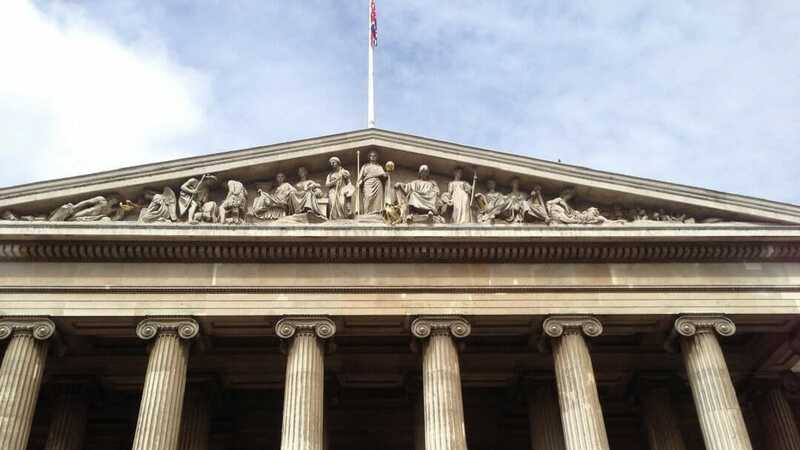 Have a plan of what you would like to see when you visit the British Museum, especially if you have limited time. Alternatively, you may want to take a British Museum guided tour. You can check out the options here. Look at the suggested list of what to see at the British Museum if you only have 3 hours on your phone, rather than downloading and printing. That way you will have pictures of the pieces you are looking for. The Sutton Hoo burial site would make for a great day trip from London. Disclosure: No financial compensation was received, but the Hoxton did provide a discount for our stay. As always, opinions expressed here are my own. NextThe Parthenon – not the one you are thinking of! Rob – I admire your patience! The British Museum is so huge and filled with so many pieces that even if you spent the whole day you would only see a fraction of it. We didn’t always stick to our plan, but in a place the size of the British Museum you have to have some sort of game plan. The British Museum is a must! 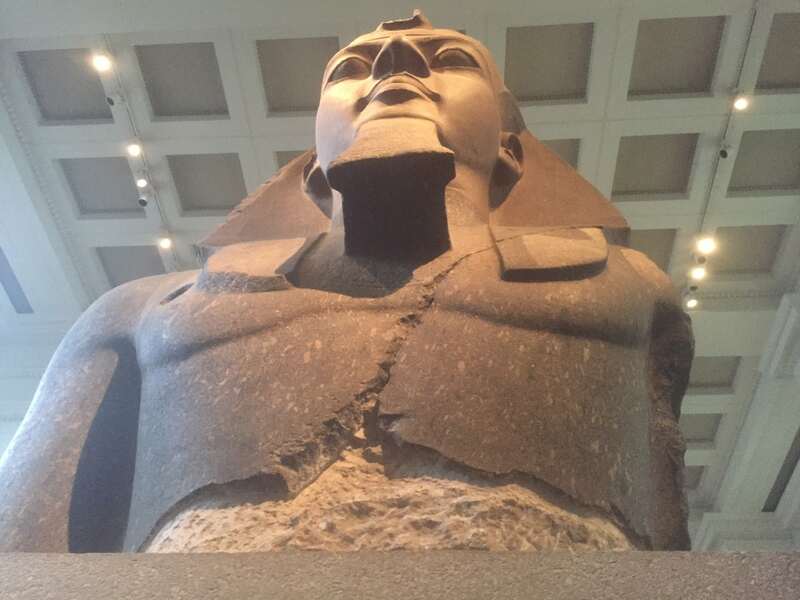 We were just there in July, and I have to say the Rosetta Stone is well worth waiting for the crowds to dissipate. It’s such a great museum. Corinne – yes the British Museum just has so many interesting pieces and agree the Rosetta Stone is another one not to be missed. Thanks for stopping by! Tanja – For us, the line to get in moved pretty fast so that was not really an issue. I agree you really need to bring your patience because the crowds are intense, but the things that you get to see are amazing. I agree that if they added a admission price it would be less crowded, but I think its great that everyone can visit without worrying about money. I wish more museums in the US were free, I would go more often. Anda – I definitely agree. It can be a little intimidating because it is so big. I want to go back and explore more too! Oh I do love a good museum. I’ve been to the British Museum before, as I live not too far from London, but there’s always something I missed (or would like to see again). I like to take my time going around museums and read every sign, drink in every exhibit. Sounds like I need to set aside a full week to do it justice! Rachel – I admire you’re patience. Even if you had a whole week not sure you could really see everything in the British Museum, but that would be fun to try! Thanks for stopping by. I am so very embarrassed to say that I have never been in the British Museum – I visited England when I was 18, for about 2 months. 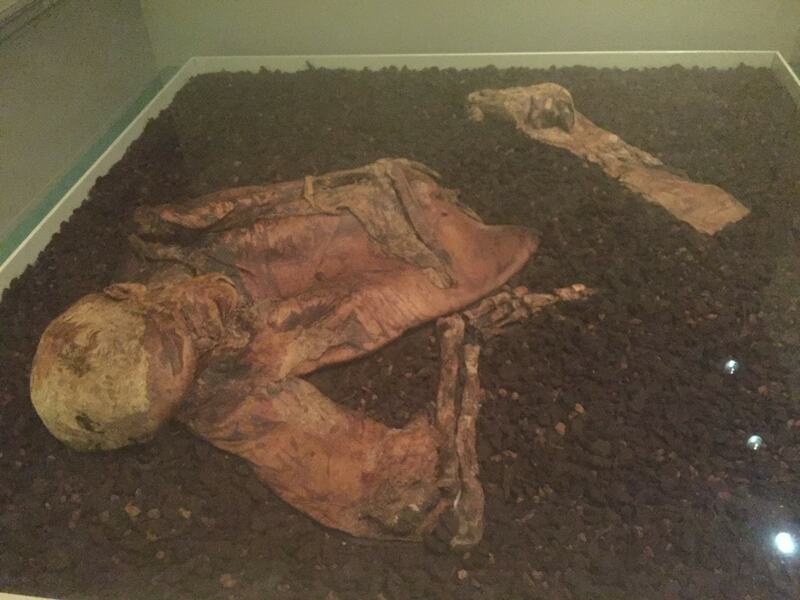 The Man that was discovered from 2000 years ago, covered in Peat Moss, that is one freaky display!!! Lisa – I hope you get the chance to go back. And yes the Lindow man is very freaky! Thanks for stopping by. Thanks for linking to #TheWeeklyPostcard; this is a great story. We have done a similar thing in both the Rijksmuseum (Amsterdam) and Prado (Madrid). It’s actually a fun challenge. We might have done something similar here in London but we arrived too late, so we’ll have to go back. So thanks for the heads-up that the online tour isn’t up-to-date. I’d definitely put the British Museum on any list of Top 10 Things to see in London, even for non-museum goers. It has such a wide variety of fascinating things to see that there really is something for everyone. The next time we’re in London we also want to see the Victoria & Albert Museum. It comes very highly recommended. Have you perchance managed to see that as well? Linda – thanks for reading. I hope you get to visit the British Museum soon. I have been to the the V & A it is nice, but really doesn’t compare to the British Museum. The British Museum just has so many historical pieces that will really impress you. I had the same reaction to the museum – I googled a “must-see” list! But this is really helpful. I never cross-referenced with other recommendations because I was in too much of a rush. The British Museum can be really overwhelming, so I’m glad you find it helpful. I hope you get to visit soon. I did a similar post about the Louvre and I’m working on one for the Metropolitan Museum of Art. 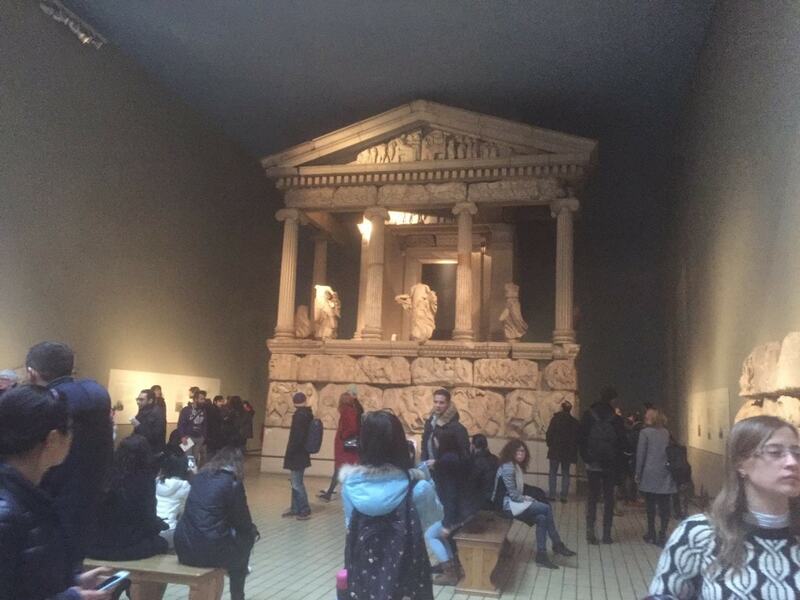 I was at The British Museum last December and had only 2 hours to spend there. I was really overwhelmed. This is a great guide on what to see in a short while. Thanks Sara! It is such an amazing place and so much to see! I don’t think you could even see it all in 1 day. It is crucial to have a plan!